I am posting today some Italian famous food quotes. There are some famous Italian phrases that have become unique to Italian life and you may find them mentioned in cookery books or in a typical restaurant menus. Italians believe that food solves anything. In Italy, people use to talk and discuss about important problems or issues around a table for lunch or dinner.
. Anche l’occhio vuole la sua parte (The eyes want their part – in the sense that something has to be pleasing to the eyes – apart from having other qualities).
. Mangia che ti passa (Eat and it will be over, you’ll feel better).
. Bevici su – I bar non porta i ricordi. 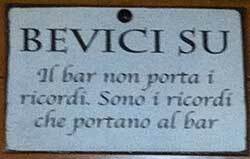 Sono i ricordi che portano al bar. (Drink in – The bar doesn’t bring memories. The memories bring you to the bar).
. L’uomo è ciò che mangia (a man is what he eats), Ludwig Feuerbach. Even if it comes from a German philosopher and anthropologist, it is one of the most popular food quotes used in Italy.
. Non riesco a sopportare quelli che non prendono seriamente il cibo.
. La scoperta di un piatto nuovo è più preziosa per il genere umano che la scoperta di una nuova stella.
. Detesto l’uomo che manda giù il suo cibo non sapendo che cosa mangia. Dubito del suo gusto in cose più importanti.
. Uno non può pensare bene, amare bene, dormire bene, se non ha mangiato bene.
. La cucina di un popolo è la sola esatta testimonianza della sua civiltà.
. No poem was ever written by a drinker of water.